The domestic pig (Sus scrofa domestica) is a subspecies of the wild boar that has more than 500 varieties. Some of the most common breeds include the Yorkshire, the Chester White, the Landrace, the Gloucestershire Old Spot, the Poland China and the Large Black. Adult pigs can reach well over 1,000 pounds. 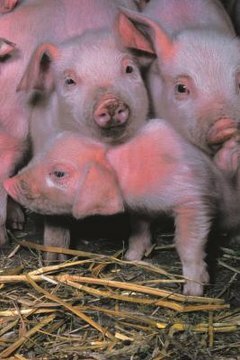 The typical life span of the domestic pig is six to 10 years, but certain problems can reduce longevity. Farm and yard pigs are much larger than their ancestors and wild pigs. Domestic pigs, bred to gain weight rapidly, can develop leg and joint complications, as well as other health problems associated with excess weight. These complications can reduce a pig’s lifetime by a few years.